It’s February, which means it’s time for Writer Recharge! I REALLY needs this, this year — like bad! First week of February: Post your goals for the month on your blog, website, or Twitter. 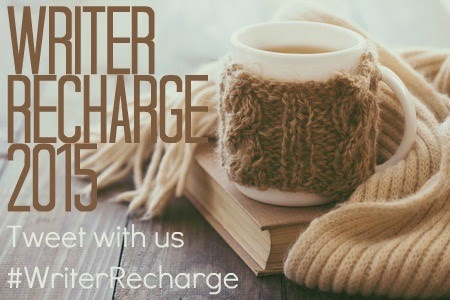 Use the hashtag #WriterRecharge. Link your blog post on Sara’s post. Write at least 500 words everyday on my WiP. Finish the revision outline for my screenplay and begin work on it. Work out three times a week. It doesn’t have to be anything crazy but it needs to happen. My plan is Tuesday and Thursday to go to my gym, and then choose one other day to do something physical that makes me sweat at least a little. I am participating in a pay it forward initiative (from Facebook). I want to send out my gifts for one of the people that signed up for mine! Participate in some Twitter writing parties! I have been trying to start Supernatural viewing parties with my sister-in-laws. Not the current season, but starting from episode one. I am a Supernatural newbie, and I think this needs to change. So. I want to set aside one day a week to spend time watching it with my sisters. This is about more than the show — it’s about spending time with two of my favorite people ever! What’s Up Wednesday: I’m Back! I have been needing to watch Supernatural for a long time. This is happening. The viewing party idea sounds fun. Good luck with your goals! I have some similar goals on my list. It’s pretty great to be jumping in on something like this. 🙂 Exercise is definitely going to become a priority this month. Can’t wait to see how we both progress! I am so impressed by your screenwriting. I’ve read SAVE THE CAT for plotting purposes, but I’m pretty sure I’d end up flailing if I tried my hand at a real screenplay. Best of luck with yours, and the rest of your goals. I’m so happy you’re joining us, Rebekah! These are great goals! And you can totally do all of them – especially the writing parties. We must get together for one! Yay! I’m so excited you’re joining us this month! You’re one of my favorite Twitter writing buddies 🙂 Good luck on your goals. Hey Rebekah! I know this will sound lame but…I have never seen Supernatural. Maybe I will do something similar some day soon. I am on the “DR WHO” kick right now and have been binge-watching epps on Netflix. Hope you have a great week! Ahh, I love you. I love these goals. I wish I’d been quick enough to get on your Pay It Forward project. So glad you’re joining the Recharge and hurry up and finish that WiP. I love you too and I wish you’d gotten on the pay it forward thing. I may still send you something anyway…I am so excited to recharge!